Two of the best flavors of classic sodas combine in these tasty Root Beer Cupcakes with Cream Soda Buttercream Frosting! If you love the classic soda flavors of root beer and cream soda, you will absolutely love these Root Beer Cupcakes with Cream Soda Buttercream Frosting! Whether you’re making them for adults or your youngsters, these are a very popular cupcake! 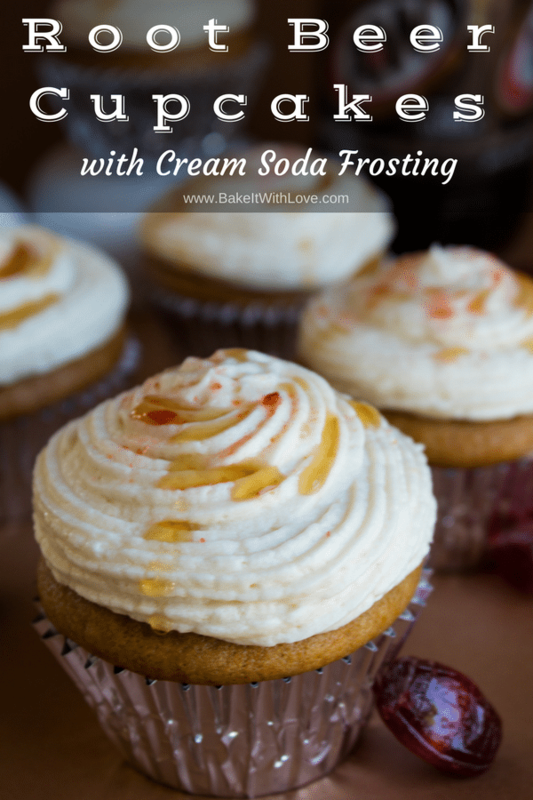 I don’t know many people that don’t love these classic soda flavors, and the root beer and cream soda flavors combine beautifully in these soft and moist cupcakes with their creamy frosting and syrup drizzle. Absolutely yummy! See the root beer barrels in the photos? One of my favorite classic candies just had to be included in this to make the flavor profile complete! The crushed root beer barrels turn out a bit pink when sprinkled onto the cream soda frosting, but the tangy root beer flavor comes through so well that it really finishes these soda-loaded cupcakes perfectly! Once these were done, I took the Root Beer Cupcakes, Orange Crush Soda Cupcakes, and Chocolate Pecan Slab Pie Bars along and made Lauren’s classroom birthday party a tasty trifecta of treats! A favorite cupcake for all ages! 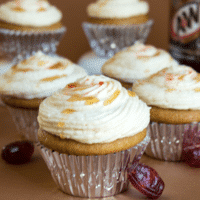 Classic root beer and cream soda flavors in delightful cupcakes! I started out with 2 20 oz bottles of root beer and 1 20 oz bottle of cream soda, you will need almost an entire bottle for the reductions (you can also use root beer extract if you have it available, or the soda syrups used in home made soda or Italian sodas). Reduce each soda down from 2 cups to a 1/2 cup by simmering for approximately 30 minutes. Set your reductions aside to come to room temperature, then refrigerate the reduced cream soda syrup for use in the buttercream frosting. In a medium mixing bowl, combine the flour, baking powder, baking soda, and salt and use a fork to combine the dry ingredients. In a large mixing bowl, beat together the brown sugar, eggs and oil. Add the reduced root beer soda syrup, almond and vanilla extracts and mix until combined. Add the flour mixture (I like to add it in gradually while mixing the batter) until the dry ingredients are just incorporated into the wet batter and the batter is thick. Add the root beer soda and mix just enough to get an even batter consistency. Divide the batter between your cupcake liners, filling each about 2/3 to 3/4 full then bake for 16-18 minutes or until an inserted toothpick comes out clean. Cool for about 5 minutes before removing from the muffin pan to cool completely on a wire cooling rack. In a medium mixing bowl, beat the room temperature butter until creamy and fluffy. Incorporate the cream soda, heavy cream, and confectioners sugar gradually by adding a drizzle of the cream soda reduced syrup (and the vanilla extract when starting) then a half cup of the confectioners sugar. Followed by a drizzle of the heavy cream with a half cup of the confectioners sugar. Repeat until the confectioners sugar has all been added. You may or may not need all of the liquid (cream soda syrup and heavy cream, if you a little left over that's fine). When you have all of the confectioners sugar added, you need a consistency that is firm but fluffy and will pipe onto your cupcakes well. Frost the cupcakes using a Wilton 21 piping tip by starting in the center and swirling out to the edges of the cupcake, then spiraling up and in to a peak. Drizzle cream soda syrup over the cupcakes, if desired. Pulse root beer barrels in a food processor to make a fine sugary dust (optional) to sprinkle on top.